Two lovely guest rooms on opposite ends of a private hall, with a full bath with shower/tub combination between them. Decorated in jewel tones of green and blue respectively, both bedrooms feature beautifully carved, high-back antique double beds. Great for families and couples traveling together, or for two individuals who prefer separate beds. An open-design Great Room with two sitting areas, dining room and kitchenette is available as a common area to the Cottage Suite and the Manager’s Suite. Add a full gourmet breakfast, served in guest room, tea room or courtyard at time of your choice. All rooms and services subject to 9-3/4% sales tax. Rates are for one or two people per room. $20 extra for additional person or for use of rollaway bed, $10 for additional breakfast. go to our property map. 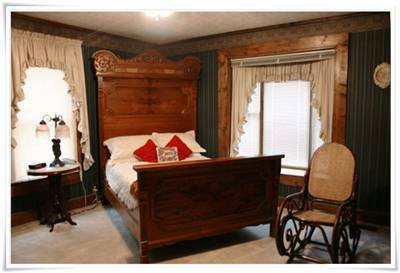 If you plan for friends or family visit your guest room during your stay, please request the Manager’s Suite or the Cottage Suite. 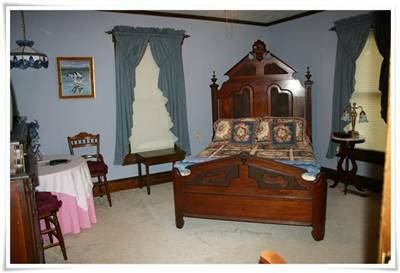 The Honeymoon Suite and the Carriage House Room are located within the mansion’s gardens, which are not open to the general public. Of course, overnight guests in all the rooms and visitors here for the guided mansion tour are encouraged to enjoy the gardens during their stay or after their tour. Closed Thanksgiving, Christmas, New Year’s Eve and New Year’s Day. Guided tours last 45-minutes to 1 hour. Tours usually begin within 15 minutes of arrival.